That in itself constitutes a title. It's like the line that says, "This page is intentionally left blank", which is a contradiction. It should have been printed on the previous page and reworded thus: The next page is intentionally left blank. Alternatively, it could have been printed on the page following the blank page - oh well, you get the idea. I'll save the humorous philosophy for other pages, but I can't resist this one. 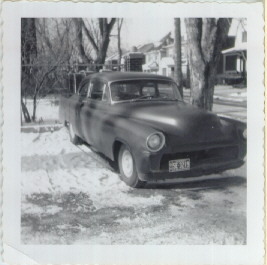 This is my Olds, originally a 1953 with slight modifications. The body obviously has been reworked to the point that the weight has increased from 3600# to 5200#. The suspension was so stiff that you'd swear that you felt a bump if you drove over a sheet of paper. At any rate, usually fast, the 59 Olds engine, a 394, with .060 os pistons, shaved heads modified camshaft and solid lifters propelled this behemoth from 0 to 60 in about 7 seconds. It was difficult, if not impossible to reach for a $50 bill on the dash without grabbing something to pull you foreward. Stopping it, however, was something else, as the brakes were never reworked with larger drums, yes drums, not disks. I couldn't think of anything to put here, so I made it purple. This page originally started as a test to see if it worked. I may just leave it here and reorganize it differently in lieu of removing it. I'm kinda getting used to it. There is virtually no significance to the placing of the above photo on this page other than "it was handy".